Create a bold new style and enhance functionality when you turn to Prenger's Flooring America for your remodeling project. At our store, we carry a full selection of fixtures and features for those looking to complete bathroom remodeling in Carroll, IA. From new vanities to custom backsplashes, you will find everything you need when you shop with us. We invite you to explore our bathroom renovation showroom for ideas that inspire. Often, homeowners overlook the bathroom when it comes to their renovation projects. While most bathroom space is small, this room has a big impact on everyone in the home. 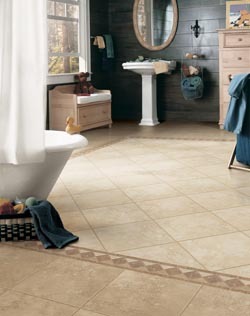 Create a look that stands out for all of the right reasons when you meet with our bathroom remodeling contractors. From half baths to master bathrooms, our well-stocked showroom offers a wide variety of products and services for every type of bathroom. We work hard to bring a fresh atmosphere to every space. With us on your side, you will create a stunning look that you are proud to show off to your family, friends, and neighbors. Create a look that is all your own when you take advantage of the custom renovation options from our company. We give you the products and services you need to tie your entire home together. From installing new vanities to switching out your backsplash tiles, we give you a range of products that let you bring the spa home. The options are unlimited when it comes to your custom renovation. Whether you prefer a classic or contemporary style throughout the bathroom, we have you covered with the many options we provide for bathroom renovation services. Our contractors are happy to advise you on every detail of your project. We take the time to meet with you to discuss your wants and needs. With this information, we are able to provide recommendations on the right products, styles, and colors for your new bathroom. Feel confident the products in our showroom carry brand names from trusted manufacturers. This assures you of choosing quality products that feature great style, clever innovations, and sturdy construction. Ask our sales and design professionals to help you select bathroom flooring, vanities, and showers that meet your lifestyle demands and decorating preferences. Know that you are not alone when it comes to customers who come to us seeking assistance with bathroom makeovers. This is one of the most popular rooms to renovate, along with the kitchen, of course. As bathrooms get continuous use, the fixtures and features wear out. Also, styles change so what may have been stylishly appealing several years ago looks outdated today. Our professionals are here to help you. They have the training and experience to provide you with helpful and specific suggestions. Ask them questions about the benefits of various brands and products so you can make informed decisions. Our goal is to give you all the assistance you need to transform a boring, mismatched bathroom into one that is stunning in design and equipped with full functionality. Two items that often get the most attention in your bathroom are the shower and the vanity. A shower renovation is one of our most popular makeovers. As many people prefer to take one, if not more, showers each day, you can see why. Let us show you the latest styles. A stand-alone shower encased in glass is one of our best sellers. Beautiful, modern, and practical, such a shower is welcome in every home. Then, too, choosing a vanity is an important decision. Not only does this hold your sink, but it offers counter space for grooming products, as well as plenty of room for storage. Your vanity often serves as a focal point for the design, so it matters what you select. Not only do we provide the design ideas and products, but we complete your renovation by providing installation services. This is extremely convenient since as you only have to deal with one contractor throughout your bathroom remodeling project. Another advantage is we back up our products and services with the strongest guarantees in the business. This is because we want you to be happy and satisfied with our services and workmanship. Contact us to learn about your options for your next remodel. We are available to assist with bathroom remodeling projects for clients throughout Denison, Jefferson, Harlan, Lake View, Sac City, and Carroll, Iowa.